Congratulations are due to MoJam Productions and its many supporters for a fantastic opening weekend of the independent, African American gay film Dirty Laundry in New York and Los Angeles. Dirty Laundry tells the unique story of a black gay man who is thrust into coming to terms with his traditional Southern family and the many secrets they hold. Only two years ago, director Maurice Jamal (Ski Trip), executive producer Nathan Hale Williams and political pundit Keith Boykin launched a campaign to raise money for the film. After it was completed the film played to sold-out screenings at black gay, Pride festivals. But celebration for Dirty Laundry’s strong weekend showings at Clearview Chelsea Theatre in New York were interrupted when the film’s producers learned the movie would be pulled from Clearview after its first week. Keith Boykin posted strong, initial reaction to Clearview’s decision writing, "I hate to say it, but this smacks of racism, plain and simple." He compared weekend performances of all the films showing at Clearview; Dirty Laundry performed near the top. However, as Boykin also wrote, Clearview management were concerned "the producers may have bought the gross" because the $1,500 in advance ticket sales for Sunday before the theater opened was "highly abnormal for a Sunday movie." While it may be unusual, Dirty Laundry’s producers deny the claim attributing the overwhelming support to "an extensive viral campaign that included Internet postings, blog articles, email campaigns and even text messages." I can attest to that; I was deluged by those messages. The black LGBT online community were quick to comment citing Clearview as an improper venue for the film, poor marketing, unlikely sustainability and some less than favorable reviews. To my surprise and pleasure, Boykin posted an update from the producers urging supporters to focus on the positive. 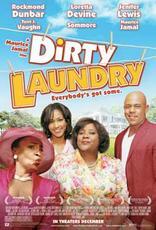 Dirty Laundry faced insurmountable odds to be produced, distributed and shown on theater screens. We should take pride in another example of the black LGBT community increasingly taking charge of creating our own images. Dirty Laundry opens in Atlanta, Washington, D.C. and Baltimore on December 28. The DVD is scheduled for release in February 2008.